Comments: Deciduous broadleaf native to Northeastern China (near the Russian border). Man has cultivated Apricots since 1,000 B.C. and the Spanish Padres likely brought this fruit to California in the 1770's. 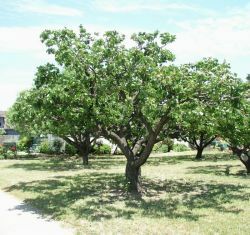 Apricots were extensively grown in Washington Township until urban growth replaced trees with houses. Though the tree can reach 40' or more, most are pruned to low growth.